Bletchley Ladies ran riot on the Intermediate Cup on Sunday, crushing neighbours Buckingham Swans 65-5 at Manor Fields. After finally kicking off their 2017-18 campaign last week, with a close 34-40 loss over at Buckingham, Bletchley were again scheduled to meet the Swans, this time on home turf in the Ladies’ Intermediate Cup. The Swans opened the game, but Bletchley took the catch, passed back to Rachael Taylor who popped it up and down the pitch. The Swans took the catch and recycled it, but Bletchley quickly regained possession. A knock on from the Swans gave them the scrum on the visitors 22. The Swans fought back and forced a knock on, then gave a penalty. Bletchley continued their pressure and after 7 minutes, this paid off, with Caroline Collie putting the ball down. Taylor did her bit to open the score; 7 – 0. Just two minutes later, Collie made a break through the Swans lines to move it to 12 – 0. The Swans stepped up a gear and tried to move up towards the Bletchley line, only to be met by the Bletchley Bulldog. Eventually, thanks to a penalty from Bletchley, they managed to move out of their half, only to have Beth Metcalf rip the ball from a ruck and set Bletchley back in motion towards the Swans’ line. The ball moved out to Collie, who kicked it to touch. Bletchley turned over the resulting line out and continued their advance. Taylor tried a sneaky pop over, but it went a tad too far and Buckingham touched it down, giving them a 22 drop out; to no avail. Collie made another break and moved Bletchley back to the 5m line before she was caught. 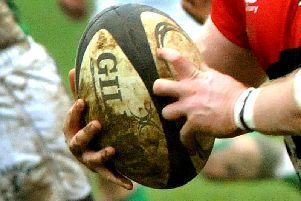 Buckingham continued to fight, pushing the game back to the 22, but eventually gave a penalty on the line, which Bletchley converted into points; 15– 0. Bletchley pushed up again from the restart; this was stalled by a penalty, giving the visitors the opportunity to take back lost ground. Finally Bletchley stole the ball back, pushing up into the Swans’ territory. A miss-judged kick went straight out, looking to give the Swans a respite; luck wasn’t with them and a hooked ball lost them the chance. Bletchley took a scrum, passed the ball out till it found Metcalf’s, who made a break from halfway to put the ball down in the final play of the half. Taylor did her business and the half finished 22 – 0. Bletchley continued their form straight from the start of the second half, putting the next points on the sheet just one minute in, courtesy of Collie again; 29 – 0. Buckingham were not in the mood to roll over though and continued to fight. The teams both dug in, but a penalty from Bletchley gave an opening. They took a quick one, pushed up and set up a maul. This didn’t go anywhere and Bletchley got the ball back, only to knock on as it was passed out of the scrum. Buckingham lost the resulting scrum, but were on their toes and intercepted a pass to make a break and finally get rid of their duck; 29 – 5. For a while play moved back and forth in the middle of the pitch, but Bletchley slowly got things moving again, then kicked down to the Swans’ 22. Again the line out wasn’t straight and Bletchley chose a scrum. The ball passed through the hands to Charlotte Gallop who took the next points; 34 – 5. The tries continued to come: Emily Gauci took the next, just four minutes later; 39 – 5, followed, two minutes on, by a try and conversion from Taylor; 46 – 5. The next one went to Taylor too; 51 – 5, with Collie clocking up the final two tries, the second in the final play of the match, giving a resounding victory to the Bletchley Ladies; 65 – 5, and a place in the next round of the cup. Next week the ladies continue their league games, hosting Old Leamingtonian Ladies.